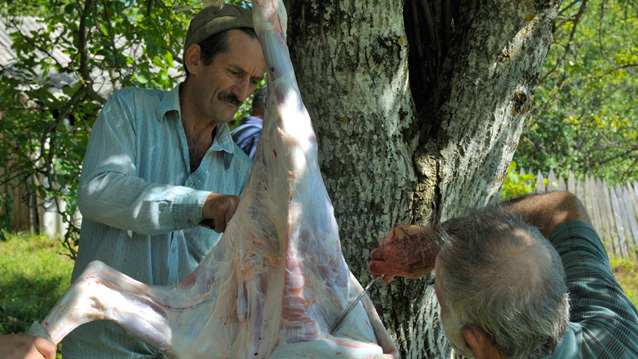 Leo (left) and Murman skinning the calf. Kote, Murman and Leo toasts for a well done job. have to butcher and quarter the animal your self. This year we bought a 4 month old calf from a local farmer. The calf had only been drinking milk from his mother, and no grain food had been given to it. That results in a meat quality you don’t get in shops. Butchering your self you can also control the tendering of the meat, boosting the quality by allowing more tendering than commercial producers do. You also have the control over the quartering, so you can get out all the good parts of the animal. 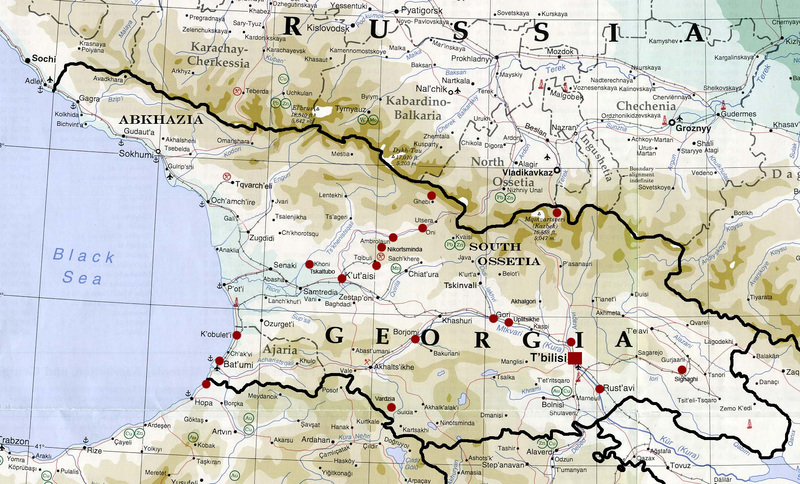 My experience is that Georgians are sloppy with this. It’s not unusual that they bang away with an axe, not bothering much about how different parts should be quartered. Personally I like to spend time fine-cutting the best parts like beef and roast. Calves are usually killed by slitting their throat with a knife. Why not buy some 6 months old chickens for your stay? We do. It’s great to have your food walking around your house. And it doesn’t require much work either. The chickens eat corn, so the only thing you have to do is set up a small house for them, and give them corn once a day. The rest they pick from the nearby area themselves. If you buy chickens from a local farm, you need to lock them up inside your newly made chicken house for 24 hours. That is done to program the new location into their heads. Then when you let them out make sure to put water and a bowl of corn inside the house. They will walk about until 19.30 before they return to the house. They never go further than 50-60 meters away, but hawks and falcons are permanent threats from above. Slaughtering the chickens it’s quite easy. You catch one inside the chicken house; bend the wings backwards at the same time as you firmly hold their feet together in one hand. 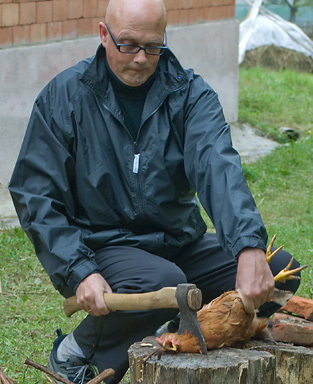 The chicken will then be paralysed and you can chop it’s head of with an axe. Release it at once and let it bleed empty. Dip it in hot water for some seconds and you can easily remove the feathers. In Racha it’s easy. 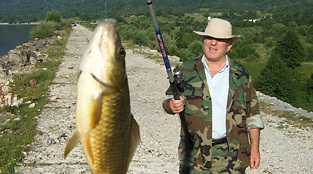 Carpe can be caught in huge numbers in the nearby lake Shaori. Angling with small pieces of corn does usually do the trick. But you have to get up early at 5 o’clock in the morning to catch it.. Trout is a different story. It’s not much of it, and you cannot base your dinner on a catch. 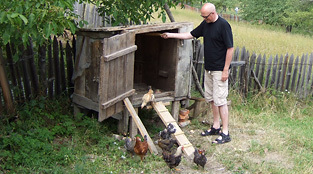 Chickens and our fashionable hen house.